There seems to be a new technical innovation every day in the field of cycling (wether it’s ebikes or “normal” bikes). Few of these innovations are as revolutionary as a continously variable automatic transmission, as the NuVinci N380 with the H|Sync technology that we have been testing in the last few weeks. In order to understand what we are talking about, let’s start from what it feels like from the user’s point of view. Imagine pedalling on a bicycle where you never have to change gears: the right ratio is automatically selected. Better than that: you don’t have the usual 7, 9, 11 or more pre-defined speeds: the transmission ratio varies along a wide continuum, without you even noticing. All you have to do is pedal (helped by the motor) and steer the bike. If you are a keen urban cyclist, you know that you have to change speeds all the time: start, stop at a red light, restart, slow down for a pedestrian, reaccelerate, take slow corner, reaccelerate… you know what we are talking about. For an urban cyclist, never having to change gears tastes like freedom. Always having the right cadence helps you make a more regular and healthy effort. On an ebike with a central motor, such a system moreover makes the motor work more efficiently. There are a lot of pros; what about the cons? Basically the weight, and a higher price. But it’s well worth it. We have introduced many different ideas: let’s proceed to understand everything a bit better. Continuously variable automatic transmission: what does it mean? Let’s start from the beginning: (almost) all the bikes have a number of gears (or speeds) which are used to vary the pedalling ratio. Activating a selector on the handlebars, you can make the pedals more or less “hard” to push: what changes is the meters of development that each ratio allows, that is how many meters the bike travels for each turn of the pedals. When pedals are hard, it means that each turn of the pedals makes the bike go forward many meters (let’s say 9 meters); when the pedals feel lighter, it means that each turn of the pedals makes the bike go forward just a few meters (let’s say 1,8 meters). Usually, you would select a low gear when you go slowly (uphill, or when you start pedalling from a zero speed), and a higher gear when you go faster. An automatic transmission makes it possible to automize these choices. A low gear is selected automatically when the bike goes slowly, and a higher gear is selected when the speed starts to increase. Automatic transmissions have been available for a few years, from the simplest kinds (just 2 gears) to the more sophisticated (as for instance the Shimano Alfine Di2, with 11 gears). The NuVinci N380 however is not “only” automatic; it is also continuosly variable. What does it mean? Up to this moment we have talked about transmissions with a predetermined set of gears: 2, 11, 14 or more. When you change (manually or automatically) from one gear to the next you can feel the difference, as the pedals turn clearly harder or lighter. 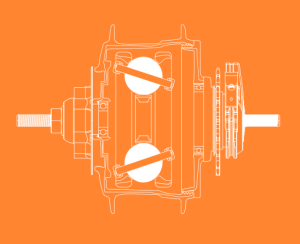 A continuously variable transmission has no predetermined gears: the pedalling ratio changes in a very gradual and smooth way, making the pedals gradually harder or lighter without the cyclist noticing it. With a continously variable automatic transmission such as the NuVinci N380 with the Harmony system, all you have to do is set your preferred cadence, an rpm value that you feel comfortable with (for instance, 70 turns of the pedals per minute). The transmission will take care of changing the ratio (almost) instantaneously, making the pedals gradually harder as you gain speed, or gradually lighter as you slow down. The system works flawlessly even under stress (contrary to what happens with the traditional change and derailleur systems). 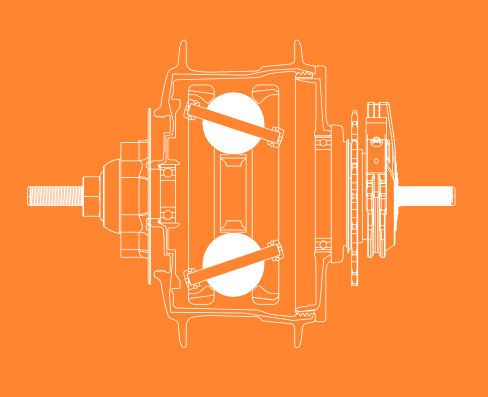 The internal gearings are completely protected inside the rear hub, and require no maintenance. Basically, after having set your preferred cadence, you can completely forget about the transmission of your bike. In this video you can see how the hub works as you pedal. Notice how the cadence is always the same, as the pedals become gradually harder. If you listen carefully, you can hear some frequent and short noises coming from the hub, both when we accelerate and when we leave the wheel to slow down by itself: that is the sound of the ratio shifting. You can hear the noise only because the camera is quite close to the N380: when you pedal you don’t hear anything. If you want to, you can use a different mode which simulates the presence of 9 predetermined gears. Basically, instead of shifing gradually, the N380 can be made to have a clear “step” from one ratio to the next. But why make your life harder? Just leave the N380 to work as it was designed to do, and enjoy the ride. But that is not all: what we have described so far works perfectly well with a “normal” bike. However, using the NuVinci N380 with a compatible ebike makes it possible to take advantage of the H|Sync system. What this means is that you don’t even have to mount a shifter on the handlebars: the N380 can be controlled directly from your ebike’s computer, where you can select your preferred cadence (which is basically the only thing you’ll ever need to do). 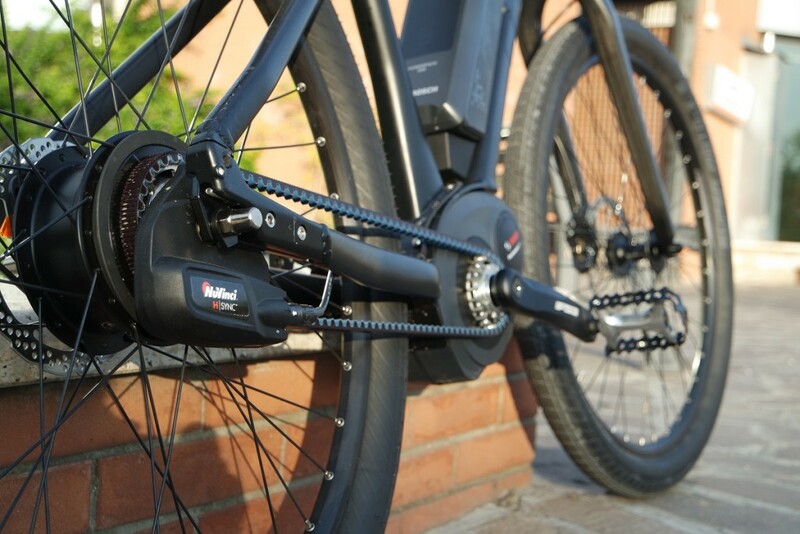 It is exactly when coupled with an ebike that we think a continuosly variable automatic transmission makes the most sense. And especially on an ebike with a central motor: a central motor works directly on the transmission of the ebike, and its rotational speed is therefore directly linked to the pedalling cadence. The NuVinci N380 makes it possible to have the motor always work at the right cadence, when its efficiency is highest. This translates into a motor which can better deliver its power and ultimately consume less energy. We have tried the NuVinci N380 on a high-range ebike, a Cube Hybrid SUV (we’ll publish a complete review of this ebike in the next few weeks). 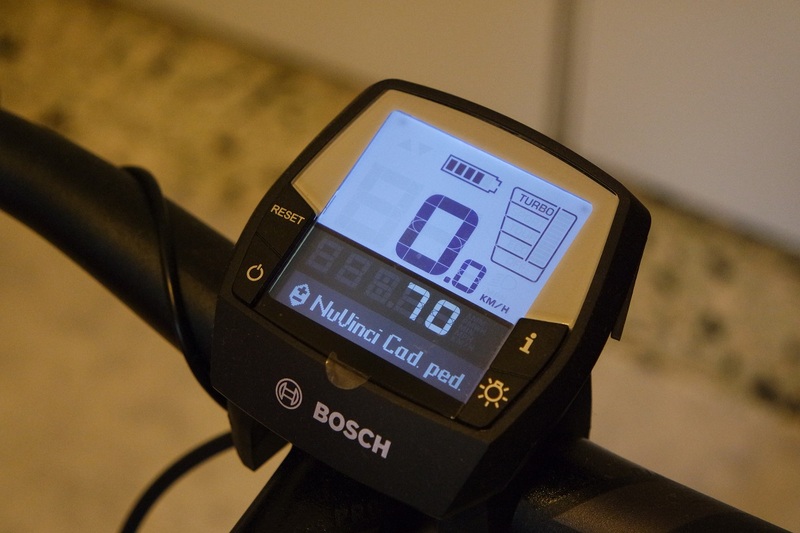 The ebike has a central motor, a 2015 Bosch Performance Line (standard version, not the CX version). The user experience is exhilarating. Just select from the Bosch computer your preferred cadence, and you’re ready to go. All you have to do is pedal and steer the bike: the Bosch motor and the NuVinci N380 take care of the rest. Starting out the pedals are light. As the speed goes up the ratio starts to gradually change, becoming better suited to the higher speed. Acceleration is extremely fluid and pleasant, at least until you reach the 25 km/h legal speed limit (this is a European ebike). Stop pedalling and the speed goes down by 2-3 km/h? The ratio changes slightly and the pedals get slightly lighter. Stopping at a red light? A very low ratio is automatically selected, and you’re ready to set off again. After a high-speed flat section you meet a sudden climb? Again, the ratio changes gradually so that you can always keep your preferred cadence. Last but not least, it is good to notice that the hub (and the transmission in general, also thanks to the belt drive) is very silent. These characteristics turn out to be very useful, making it much more comfortable to ride in an urban environment. Those who follow us regularly know that we test ebikes mainly in Rome: here, where red lights, climbs, descents, and other “urban jungle” obstacles are aplenty, you have to always change gears. Having a NuVinci N380 is a real liberation, helping you to better concentrate on steering the bike and on the traffic. In this video you can see the rapid and smooth acceleration which the NuVinci N380 makes possible, together with the “Turbo” mode of the Bosch system. From 0 to 25 km/h in 5 seconds. The acceleration in the “sport” mode is only slightly slower. 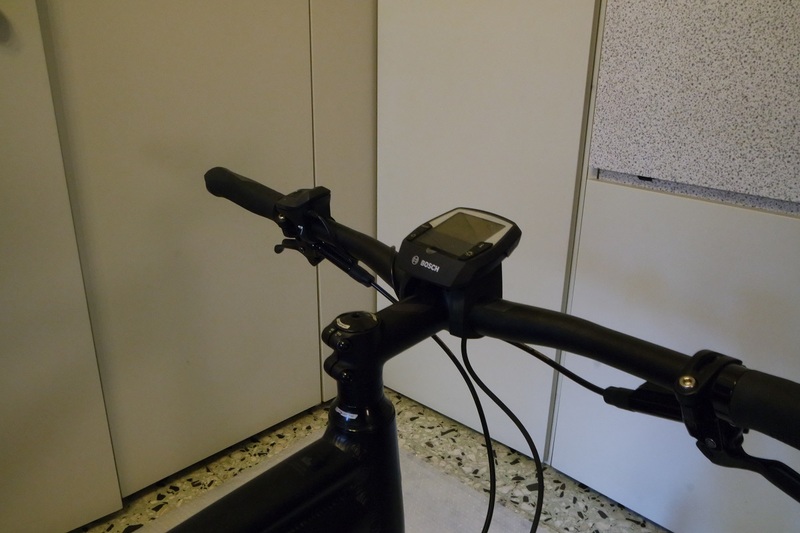 With this mode you can get about 75 km of range in an urban environment, as we will see in the test of the Cube ebike. the first con is a factor that makes us understand that such a system, though it is perfect for the city, is not ideal for an extreme-sporty use, for those who seek performance at all costs. The problem is that an automatic transmission, excellent as it can be, cannot predict the future. Let us explain. If, coming from a fast flat route, you suddenly meet a very steep climb, an experienced cyclist with a normal transmission would know what to do: change gears a few metres before the climb, so that you are ready to pedal on it. The NuVinci N380 cannot know that a steep climb is about to come, so it will start the climb on its hardest ratio, and it will begin to (rapidly) change the ratio only after a couple of pedal strokes. This can be perfectly fine for an urban cyclist, a con which is more than compensated by all the pros we have mentioned; it is fair to say that many inexperienced urban cyclists wouldn’t even notice the problem. Those who look for the maximum performance will be disappointed though. These people are problably not the target that NuVinci aims for. The second negative side is the weight. The N380 weighs 2450 grams. 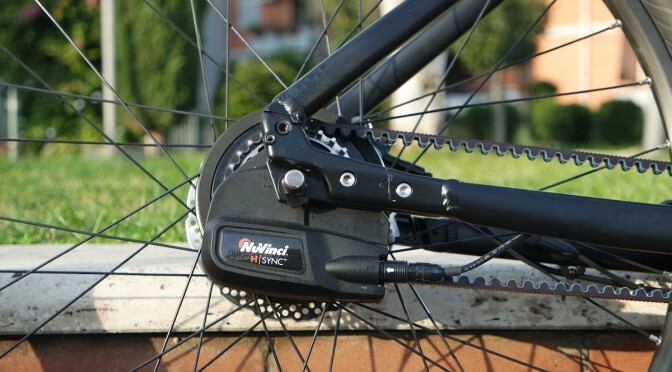 Just to make a comparison, the 11-speed Shimano Alfine hub gear weights 1600 grams; the 14-speed Rohloff has a similar weight. On an ebike this should be less of a problem though. The third negative factor is the price. Buying a N380 for your own bike will set you back about 350€. It’s not a lot of money, but it’s also not an amount that you can spend carelessly; again, the Alfine costs about 320€, while the Rohloff costs more than 1000€. Is the NuVinci N380 the right choice for me? Is such a refined hub shifting system really necessary, when the single-speed fad has shown that, after all, you can get around even with only one gear, possibly even without a freewheel? 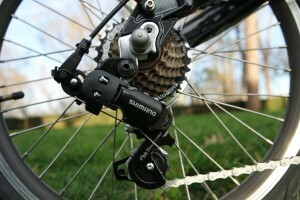 Well, everything is possible, but we think that everybody agrees that a multi-speed system makes pedalling much easier. A continuously variable automatic shifting system like the NuVinci N380 with H|Sync technology makes it possible to have a wide range of gears with an extremely simple, efficient, comfortable, clean and maintenance-free system; and your handlebars are free from selector and cables. In this article we have presented the pros and cons of this system in the most objective possible way; however, our enthusiasm for this technology should by now be very clear. The best thing you can do is test for yourself an ebike with the NuVinci N380 (as for instance the Piaggio Wi-bike recently announced). As a conclusion, we think that a 20″ ebike (to make it lighter and more reactive) with a central motor and a NuVinci N380 hub would be the ideal bike for an urban environment. The NuVinci N380 allows for a ratio range of 380%. You can go from a 0.5 underdrive to a 1.9 overdrive (0.5 x 3.8 = 1.9). You can read about the gearing you can install (front chain ring and rear sprocket) at page 24 of this technical manual. The NuVinci N380 can be mounted with disc brakes, V-brakes and Shimano roller brakes. More information on the internal gearings of this hub can be found on this Wikipedia page. The following video, produced by Fallbrook Technologies (which owns the NuVinci technology and brand) is also very interesting. 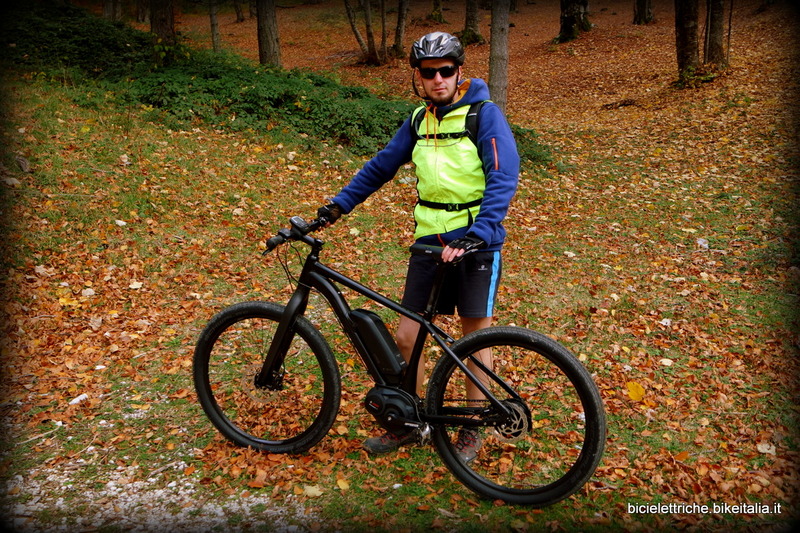 Read about our recent 1000 meters elevation gain test, it was done with this ebike.